Today I’m focusing on giving you advice on managing dry skin during the menopause. Skin gets dry during the menopause because nutrients and oestrogen levels are falling. As your oestrogen levels fall so does your collagen, which is responsible for holding everything in place. When collagen levels fall you may start to see wrinkles, saggy bits and dryness. This can be difficult to combat if you are not using quality products. 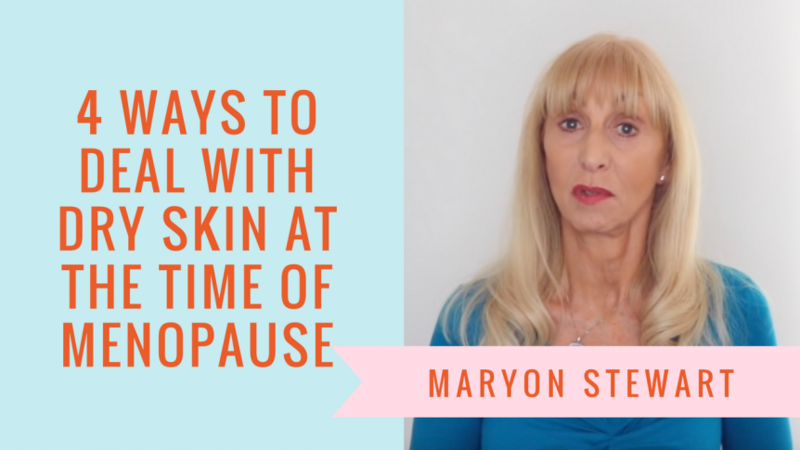 To find out my top four ways for combatting dry skin during menopause watch the video below. Here are my top four tips for combatting dry skin. Use products wit out chemicals: I recommend you use products that don’t contain parabens and chemicals as they might irritate your skin and cause unnecessary dry skin - there are of plenty natural products to buy. Exfoliate your skin: Make sure that you do a skin scrub to get all the dead cells off your skin and then rehydrate yourself. Eat foods that contain fatty acids: Oily fish, nuts and seeds are all high in fatty acids. I recommend you eat three servings a week because research shows people who consume oily fish suffer less from dry skin. Eat foods that contain naturally occurring oestrogen: During the menopause, your brain thinks your ovaries are not working properly so the factories that used to make the cells that kept your skin moist and plump go out of production. Eating foods which contain naturally occurring oestrogen like soy and flax seeds will help to get those factories back into production.